18x Eye Pieces with Adjustable Diopetric Power of +/- 6 Diopters. Measuring Range: Diopteric Power 30.0 to 60.0 Diopters in 0.25 Deg Steps Radius of Curbature 5.6 Mm to 11.2 Mm in 0.05 Mm Steps. Axis of Corneal Astigmatism is 0 to 180 Deg in 5 Deg Steps. 220 V â��240 V â�� 50 Hz Electric Supply. Base : Co- Axial with Joystick Control.lateral Movement 100 Mm Right to Left, B/f Movement 120 Mm, Five Movements 20 mm Up to Down, Chin Rest 80 mm Up and Down Movement. Eye Pieces: 15 X Paired Wide Field. Mag: 5 X- 25 X. Working Distance: F = 200 Mm. Illumination: 15 V/ 150 W Twin Halogen Lamp with Co-axial Through the Lens Fibre Optics. Arm: Counter Balanced Pantographic Arm with 3200 Rotation. Stand: Mobile Floor Stand On Five Caster Wheels for Easy Handling and Absolute Stability. Power Supply: ac 220- 240 Volts ( 110 On Request). Eye Pieces: 10 X and 15 X. Objectives: 1 X and 1.6 X. Total Magnifications: 10x,16x and 25 X.
Illumination Section: Sleet Width Adjustment 0 to 12 Mm with Out Step. Slit Length Adjustment: 0 to 12 Mm Continuos. Sleet Image Rotation 0 to 180 Deg Diameter of Diaphramme Disc: 12 mm, 7 mm, 5 mm, 3mm,1mm, 0.2 mm. Filter Discs: Cobalt Filter, Green Filter, Yellow Filter, Neutral Density and Heat Absorbing. Light Source: 6 Volts 20 Watt Halogen Lamp. Co-axial with Joystick Control, Lateral Movement 100 mm Right to Left, Back and Forward Movement is 120 mm, Five Movements is 20 mm Up to Down, Chin Rest 80 mm Up and Down. Diameter of Lens Accomodated is 30 to 80 mm. Tilting Angle is 30 Deg to 90 Deg. Electric Supply is 220 V Ac â��3 W Led. Astigmatic axis: 0 to 180 degree. 15 X Eye Pieces with Adjustable Diopetric Power of +/- 5 Diopters. 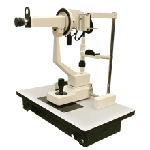 Measuring Range: diopetric Power 36.0 to 52.0 Diopters in 0.25 Steps.radius of Curvature is 6.4 to 9.5 Mm in 0.05 Step. Dual Eye Level Sighting System. Axis of Corneal Astigmatism is 0 to 180 in 5 Deg Steps. Adjustable Head and Chin Rest with Ocular. 220 V â��240v 50hz Electric Supply. Paint Fianish is White or Black.